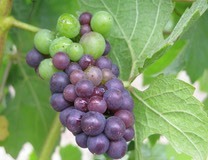 The Wightman Vineyard produces 100% Martini Clone Pinot Noir grapes. Combine this unique style with James' skills and you get a Pinot Noir which has fantastic qualities. The initial nose gives off a slightly closed earthy raspberry liquorice style, however when you take that first mouthful the wine expands into great cola and bright maraschino cherries. The finish is long and the tannins robust yet subtle. I have no doubt at all that this will benefit from further cellaring, its also pretty dean good right now with a nice filet steak. Another classic from the MacPhail stable.